The goal of this wiki is to give an overview of what augmented reality is, its history and evolution as seen in many fields and to critically evaluate the use of augmented reality in education. The wiki was formerly housed at the University of Illinois WikEd (2009) and later at Wikispaces https://augmented-reality-in-education.wikispaces.com/ (2010-18) and now here after the closing of Wikispaces. Augmented reality (AR) according to Ronald Azuma, Research Leader at Nokia Research Centre, is ''"an environment that includes both virtual reality and real-world elements. For instance, an AR user might wear translucent goggles; through these, he could see the real world, as well as computer-generated images projected on top of that world."'' (Azuma, 1997). Augmented Reality in simple terms is the fusion of digital information with either live streaming video or the viewer's real environment. One of the first times many people may have become aware of this type of augmentation of reality may have been when watching a sporting event on television. Television viewers are now used to seeing the virtual "first down" line superimposed on the field. While watching baseball on television, viewers see advertising boards behind the batter as the player takes a swing. Did you know that that board is not really in the stadium, but is a virtual representation similar to the virtual first down line on the baseball field? In football, the down marking adds information to the scene, while the virtual billboards remind us who is paying to bring the sporting event to us. In these two simple examples, we can see two ways that augmented reality can be used. According to Larry Fisher at ABI Research, a marketing intelligence company specializing in technology, ''“The augmented reality market will diversify into multiple markets, which will generate nearly $190 million in mobile applications, games and customized augmented-reality revenue, and nearly $170 million in mobile augmented-reality advertising revenue, by 2014,”''[http://www.mobilemarketer.com/cms/news/advertising/4475.html] One of the keys to this increase will be accurate GPS location service for mobile devices. With accurate GPS information, developers are able to tag a location. The tag then relays added information about the location to the viewer. In addition to Azuma's definition of Augmented Reality, there is also a different definition given by Paul Milgram and Fumio Kishino. Their definition is contained within the Milgram Reality-Virtuality Continuum. To the left is the real environment, and to the extreme right is the virtual environment. A Virtual Reality] ('''VR''') environment is a computer simulated environment that may simulate the real world or an imaginary world. One example of a Virtual Reality environment would be Second Life, the virtual world created by Linden Labs and launched in 2003. Between these two extremes of real and virtual is a Mixed Reality '''(MR)''' that includes the left continuum of augmented reality and the right continuum that is augmented virtuality. 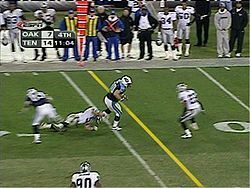 If we consider the "first down" line as an example of a very simple augmented reality, the Wii could illustrate a more interactive rendering of AR. Here the user reacts in the real world to perform some activity that can be seen in the both the real and virtual world. The engaged user is able to learn a skill or attain a goal, such as getting fit. Augmented Reality in Education was a created by Karen E Hamilton as part of the Curriculum, Technology and Educational Reform (CTER) program at University of Illinois- Urbana. Karen is a professor and online coordinator in the School of Liberal Arts & Sciences at George Brown College in Toronto, Canada.